Butterfly Pea Flower sticky rice dumplings, Vietnam House, Saigon. As I mentioned in my post listing our Top Travel Experiences in 2018, we visited 15 countries over the past year, 9 of them new to us. All of which means that we had a lot of opportunities to sample dishes and check out restaurants that we hadn’t experienced before. 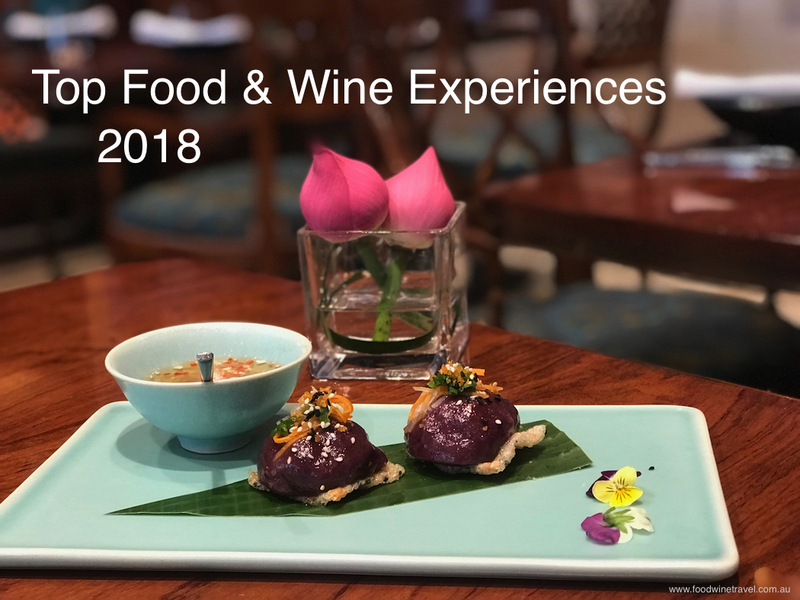 We also did a number of walking tours that introduced us to some great foodie finds in Hong Kong, Saigon, Miami (Florida) and even Parramatta, NSW. These were our Top Food and Wine Experiences in 2018. 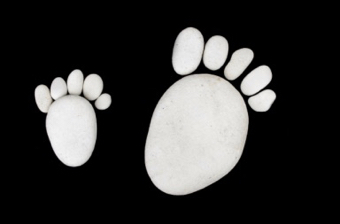 They weren’t necessarily the most expensive – some were very simple pleasures – but they are the experiences that stick out most in our memory. Dining at Sean Connolly’s chef’s table was a treat. The year was off to a good start when I was flown to Adelaide to dine at the Chef’s Table at Sean’s Kitchen in the Riverbank Precinct. I first met Sean Connolly when he was executive chef at Astral in Sydney in the late ‘90s. 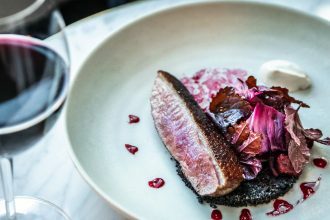 In contrast to the food there, which was fine dining and at the cutting edge of cuisine at the time, Sean’s Kitchen is casual and relatively simple, focusing squarely on the amazing produce that South Australians are blessed with. Sean himself hovered at the table in between throwing lobsters into the pot and carving succulent Black Angus beef. Cocktails made with Green Ant Gin added a unique flavour to the evening (and, yes, the gin is actually made from green ants, which produce a flavour akin to lemongrass). Lobster macaroni cheese at Ojai Valley Inn, California. 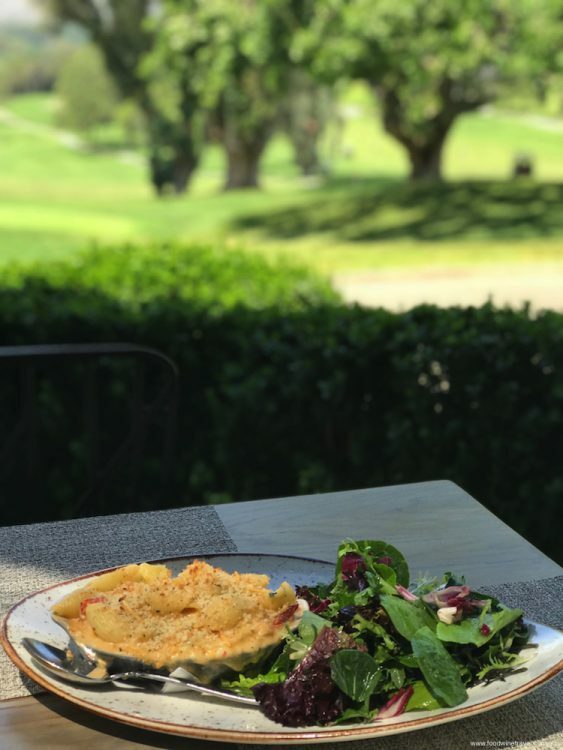 Within a couple of hours of picking up our hire car in Los Angeles, my daughter and I were having lunch at the gorgeous Ojai Valley Inn, where we sat on a terrace overlooking the resort’s golf course. It’s a beautiful setting, surrounded by centuries-old oak trees, pretty gardens and sweeping mountain vistas. We couldn’t wait for the sunset but it is said to be magnificent as the mountains take on a pink glow. We loved The Oak restaurant menu which uses a lot of locally sourced products, many from the resort’s own garden. Oh my, the lobster macaroni cheese was a complete and utter drool fest! 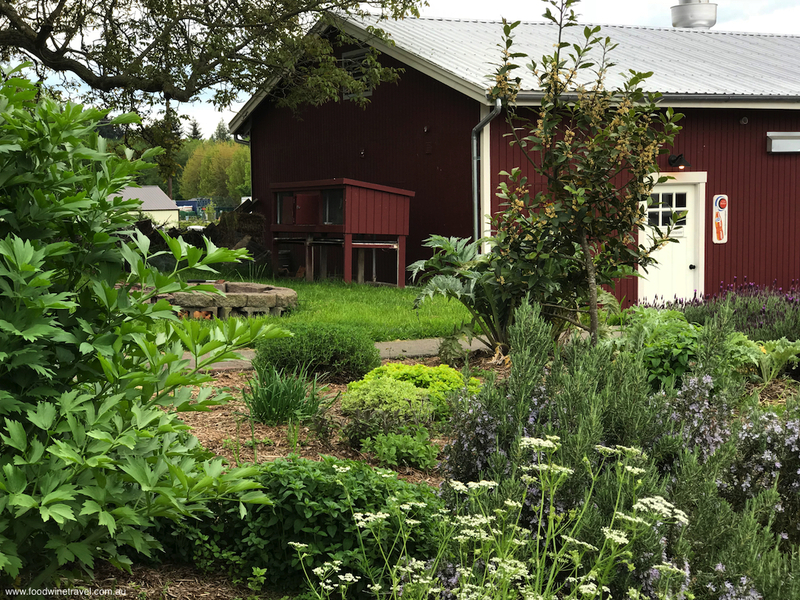 Farm-to-table at Orchard Kitchen on Whidbey Island. Dining at long, communal tables at Orchard Kitchen was one of the highlights of the International Food, Wine & Travel Writers’ conference I attended on Whidbey Island in April. Vincent and Tyla Nattress opened the restaurant on their five-acre organic farm in 2015. Chef Vincent is a Whidbey Island native who worked for many fine restaurants in Europe and the Napa Valley, but it is back on his home turf that he has found his niche, supplementing his produce with supplies from local farmers, vintners, cheesemakers and fishermen. 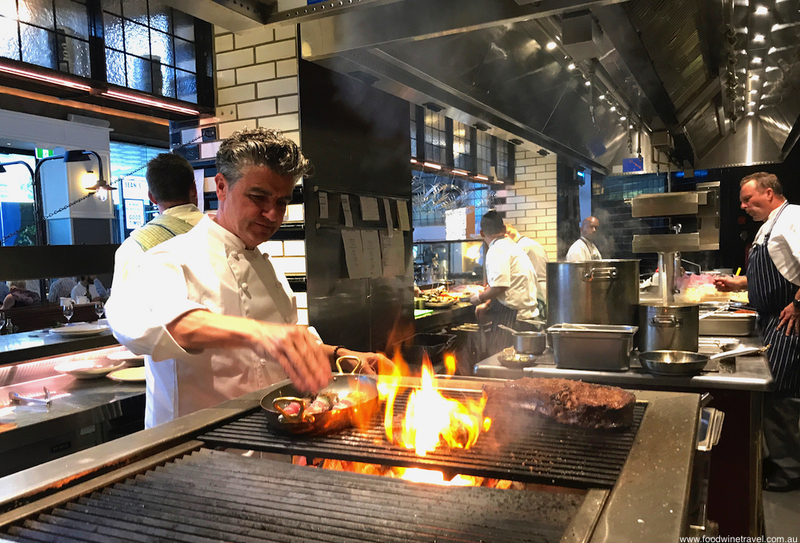 Working in an open kitchen, a few steps away from his guests, he serves a seasonal menu that changes weekly. It’s almost like dining at home: guests are served family style, with a warm pre-dinner welcome to ensure everyone feels at ease. Little wonder Orchard Kitchen has become one of the island’s most acclaimed restaurants. Luxury dining upfront on Virgin’s Sydney to Hong Kong route. I know what you’re thinking – an airline meal couldn’t possibly be a highlight, right? Wrong. 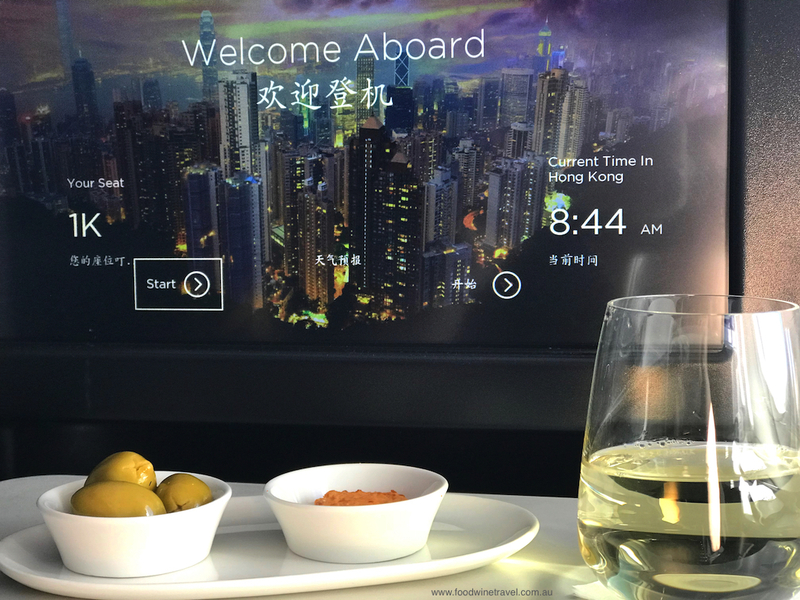 Mid-year we flew to Hong Kong on Virgin’s new service from Sydney and because we did it on points, we flew Business class, a luxury we don’t usually allow ourselves. I’m not exaggerating when I say that the meal we had was as good as any we’d get in a first-class restaurant. It started with sun-dried tomato and parmesan biscuits and some green olives which were stuffed with lemon and tasted divine. The Luke Mangan-designed lunch included a salad of beetroot, caramelised pear, walnut and goat’s cheese, and a melt-in-the-mouth lamb moussaka which was unbelievably good. 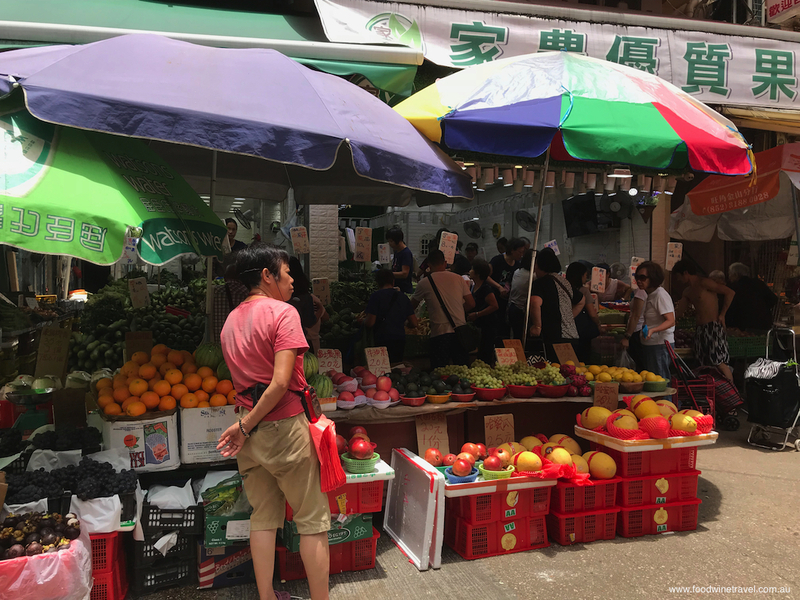 Mongkok market, on Eating Adventures’ walking tour. Doing a walking tour is always a great way of getting to know a city through the eyes of a local. Combine that with a food theme and I’m truly in my element. William, our guide on Eating Adventures’ Hong Kong tour, is a retired pharmacist and keen cook. He was the perfect guide for seeking out little gems that we could never have discovered on our own, places like the restaurant doing snake soup (one of only a handful still doing so), a third-generation family business selling goose meat, a cake shop and a tofu shop (both operating for more than a century), a wonderful dim sum restaurant and a traditional herbal tea shop doing sour plum tea. I’ve always thought that Hong Kong is one of the world’s great food cities but under William’s tutelage, it really captivated me. Placoderm (extinct fish) replicated in L’Hotel Island South’s Geolicious menu. This was one of the most unusual meals we’ve had – a full degustation menu where every course is inspired by an unusual geological feature. L’Hotel Island South is one of two Hong Kong hotels that have a strategic partnership with Hong Kong Geopark, a UNESCO-listed park known for its spectacular volcanic rock formations. 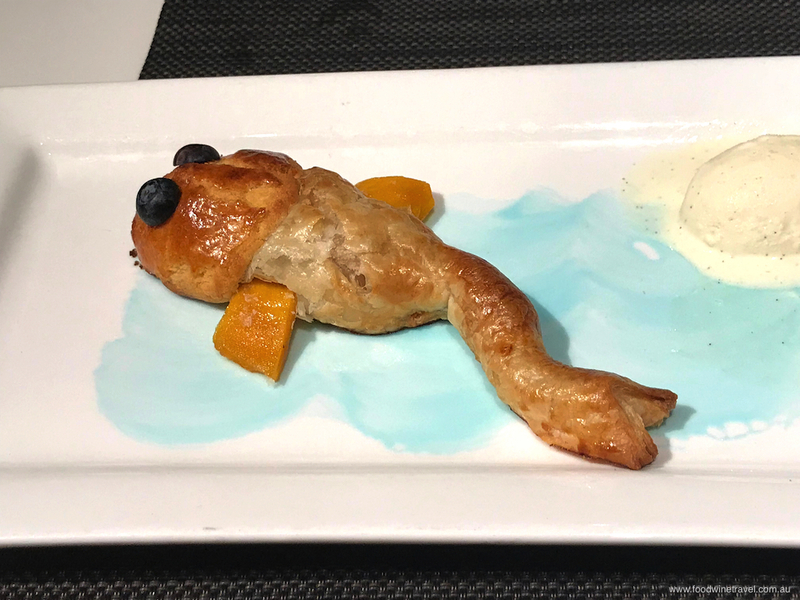 In keeping with the theme, the hotel restaurant has created unique cocktails and dishes such as a ham salad that looks like Bluff Rock, a goulash that looks like bubbling lava, and even a dessert in the shape of a placoderm (extinct fish). It’s wacky and fun, yet a serious introduction to an important natural heritage site that many people don’t even know exists. 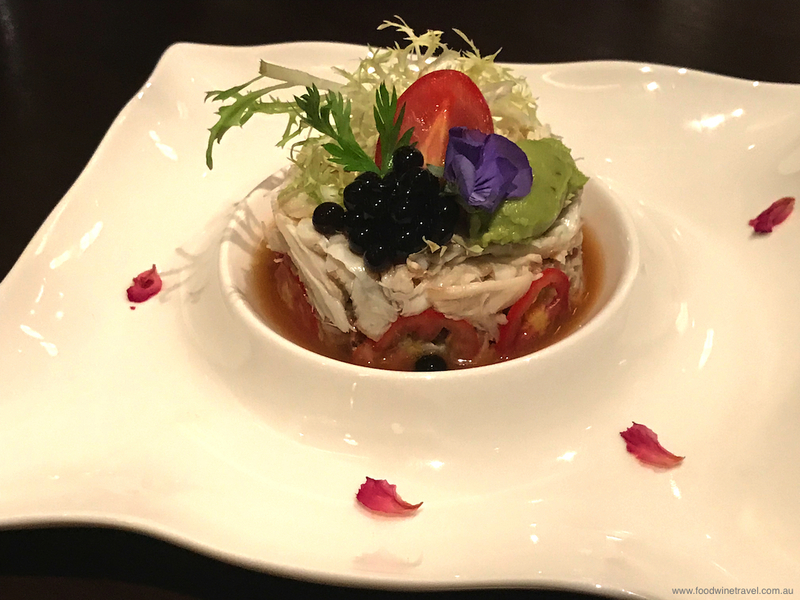 Crabmeat with avocado and black vinegar caviar, La Chine, Macau. You could be forgiven for thinking that you are in a Chinese Disneyland when you’re on the sixth floor of a half-size replica Eiffel Tower, but then everything about Macau seems a bit unreal. What is real is just how damn good the food is at La Chine, the fine dining restaurant on the sixth floor of the tower. The food is an exquisite blend of French ingredients and classic Chinese techniques, so you’ll see barbecued foie gras on braised noodles with wild mushrooms and ginger, for instance, or crabmeat with avocado and black vinegar caviar. We adore Gillardeaux oysters and at La Chine they come with Sichuan pepper and a cucumber-mint jelly. Canard à l’orange is not just any duck with orange, it’s crispy roasted and served with an orange-black pepper sauce, while a caramelized pineapple tarte tatin comes with coconut icecream. The best egg tarts ever, at Lord Stow’s bakery in Macau. 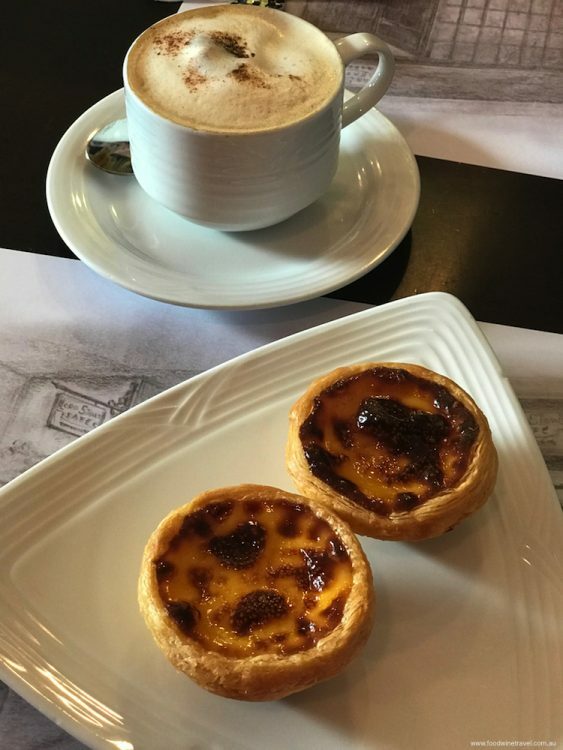 We’ve had egg tarts in Portugal, we’ve had egg tarts in Hong Kong, but nowhere have we had egg tarts as good as those we had at Lord Stow’s in Macau. There are a few Lord Stow’s bakeries in Macau (as well as franchises in other Asian countries) and we bought tarts from a few, including the original bakery that opened in Coloane, Macau, in 1989. Andrew (“Lord”) Stow was a British migrant who combined English, Portuguese and Chinese influences to create his egg tart, using fresh cream instead of water and flour to make the pastry, and adding caramelised sugar and a sprinkle of cinnamon on top. Perfection. Egg Coffee at Vân Yến Art Café. 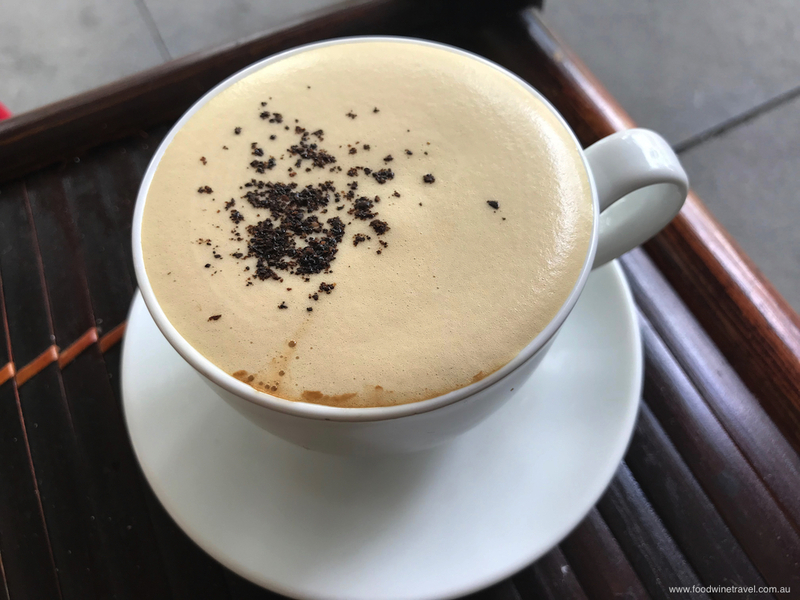 Egg coffee is a Vietnamese specialty and while it sounds unappetising, it is in fact delicious. It was created in Hanoi in the 1940s during a shortage of milk, and the ingredients have remained much the same: egg yolk, Vietnamese coffee powder, sweetened condensed milk and sugar. I introduced Maurie to it, who promptly decided it was his new favourite drink, and then the rest of our month in Vietnam was spent in a quest to find the perfect cup. The one he voted best was at a very ordinary looking café at the corner of Quán Thánh and Hoè Nhai (opposite the park), so ordinary looking that we’re not sure it even had a name. We also really liked the egg coffee at Vân Yến Art Café, where we sat Vietnamese-style on little stools on the footpath watching the world go by. Breakfast at Bánh Cuốn Bà Hanh: cheap and delicious. At this unassuming restaurant, the banh cuon are made on the spot, right in front of you. These steamed rice rolls are a favourite breakfast dish, and honestly, I thought I’d died and gone to heaven! You’ll see them being made at other restaurants in Hanoi’s Old Quarter but none looked as appealing as the ones made by the little old lady at Bánh Cuốn Bà Hanh. She’s apparently a bit of a legend. Watch how thin she makes the delicate rice flour sheets! 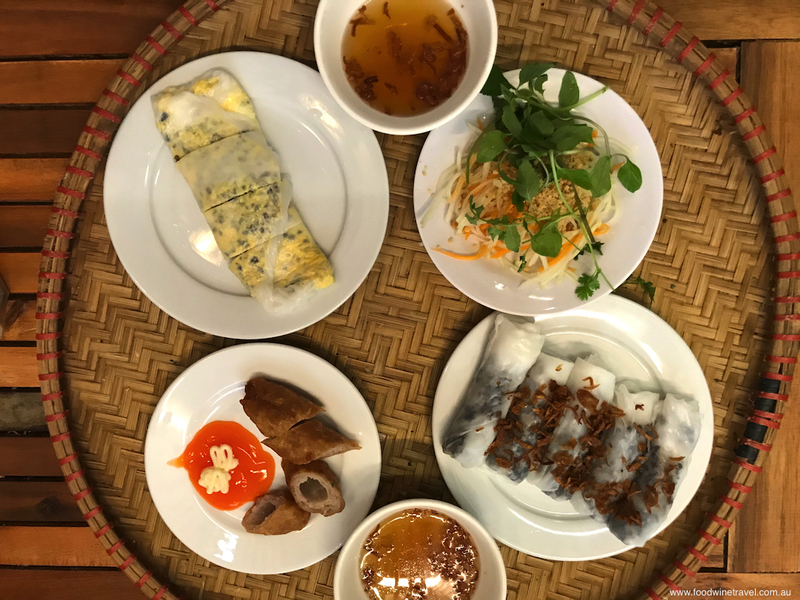 We loved the rolls with pork and woodear mushroom stuffing, but other variations are available, and you can order a mixed plate which comes with other Vietnamese specialities, such as mushroom omelette and pork lemongrass skewers. Wonderful ambience at Manda de Laos, Luang Prabang. We visited this restaurant in Laos on the recommendation of a fellow traveller. Sometimes recommendations from people you don’t know can be hit and miss, but he’d raved about Manda de Laos so much we thought we should try it. And, boy, we are so glad we did! 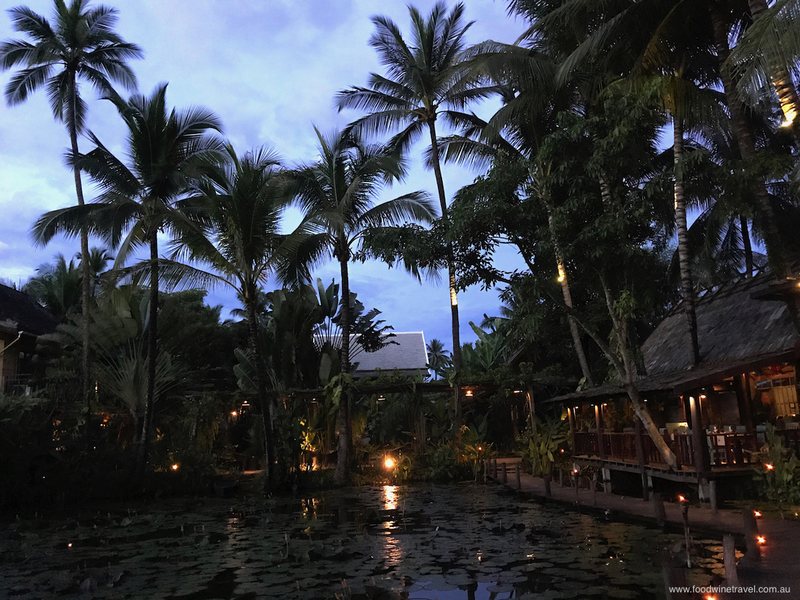 We arrived at the restaurant just on dusk and were blown away by how beautiful it is, with all the dining spaces opening onto ponds filled with waterlilies. Our candlelit table was on its own little deck jutting out into the pond, which made it feel very private and luxurious. 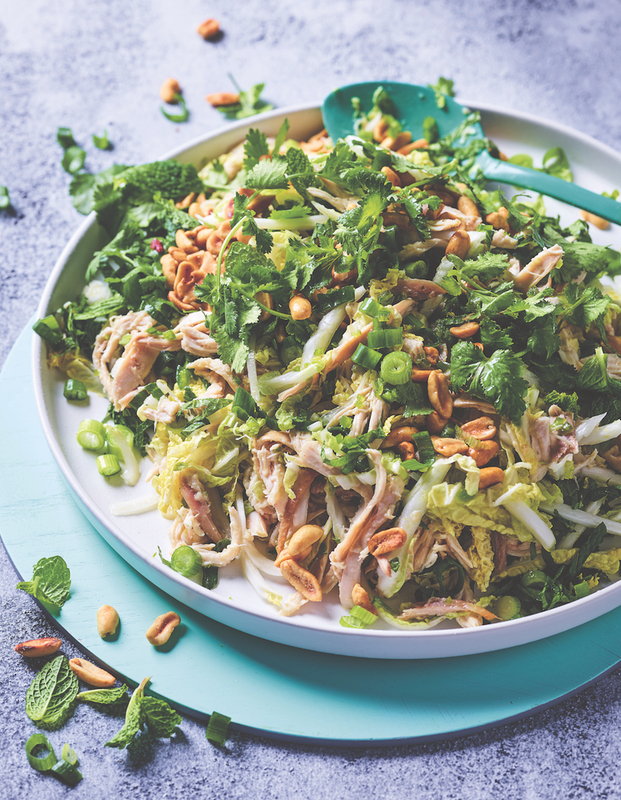 All the recipes are based on Lao family recipes, albeit sometimes with a creative twist, as in the deep-fried bamboo filled with minced fish and herbs. The restaurant has been in the one family for generations and the lily ponds are listed as a UNESCO World Heritage site. Beautiful food, brilliant service and ambience. Even the steamed rice is colourful at Meena, Chiang Mai. Meena is one of Thailand’s hidden gems, tucked away in a lane in Sankamphang, about seven kilometres from downtown Chiang Mai and a world away from the busy tourist streets. The restaurant offers what it describes as “Rice-based Cuisine” and you’ll find rice presented in ways you might never have thought of. There’s a berry herbal drink, for example, made from rice water, while deep fried prawns are coated in a sticky rice batter. 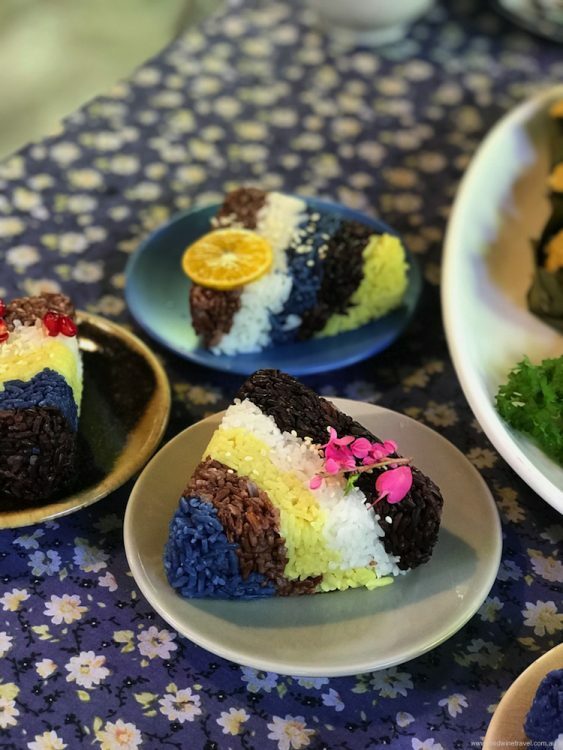 Even the steamed rice on the side is a standout, presented in a wedge of five colours, all natural — white, red, black, yellow and a blueish/purple. Along with colleagues from the Australian Society of Travel Writers, I enjoyed a wonderful banquet in an outdoor pavilion, overlooking ponds and wooden rice barns decorated with rice accoutrements and old-fashioned charm. 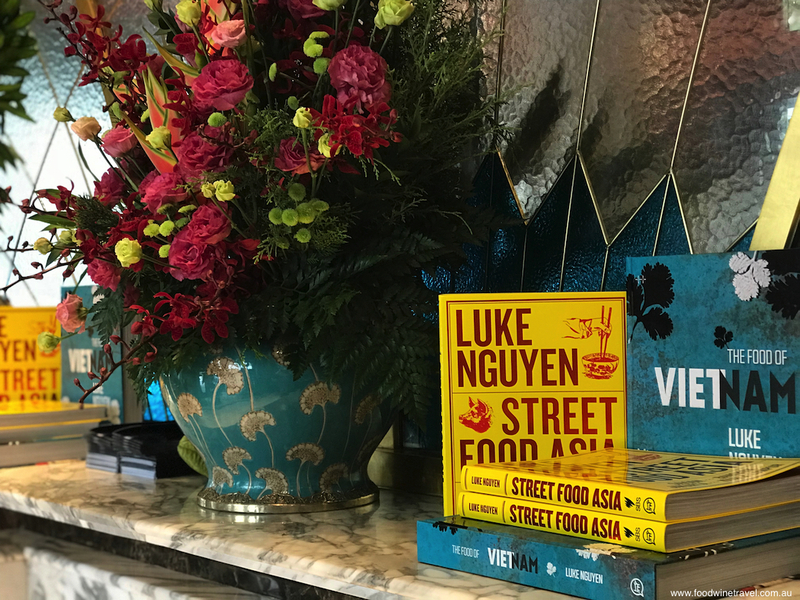 Dining at Luke Nguyen’s Vietnam House: a highlight in Saigon. Despite spending more time in the USA than we did in south-east Asia this year, there’s a preponderance of Asian experiences in this list. That’s not surprising, for if you’re travelling on a budget, it’s much easier to eat like a king in Asia than it is in America. Furthermore, Vietnamese happens to be one of my favourite cuisines, and I especially love it when chefs take traditional dishes and give them a contemporary touch, providing it is done with sensitivity. Vietnamese-Australian chef, Luke Nguyen, never seems to put a foot wrong in this regard. It was a treat to dine at his elegant Saigon restaurant, Vietnam House, located in a restored colonial building that once housed the famous Café L’Imperial. Sherwood Suites offers a meal here as part of its Soul of Saigon package, and it was a fitting end to our south-east Asian odyssey, dining on flavoursome Tamarind & Pineapple Fish Soup, Crab & Iberico Pork Rice Flour Crepe, colourful Butterfly Pea Flower sticky rice dumplings, and tropical-flavoured desserts. Our guide, Hiep, on a Walking Foodie Tour of Saigon. 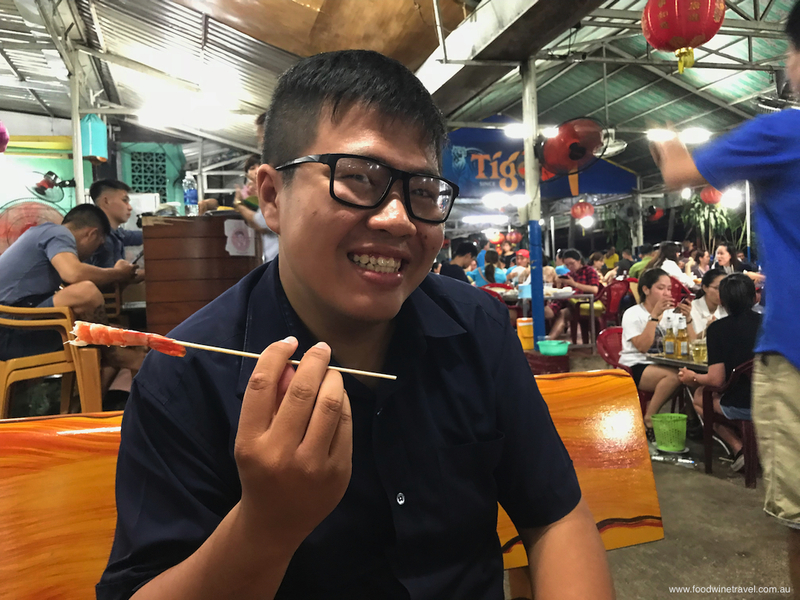 As with our Hong Kong walking tour, we would never have known about some of the intricacies of dining in Saigon if it hadn’t been for the informative night tour we did with our guide Hiep. Like the lunch at Vietnam House, it was offered as part of Sherwood Suites’ Soul of Saigon package, and as with the Hong Kong tour, we were totally stuffed (with both food and exhaustion) at the end of it. We started at an outdoor seafood restaurant filled with locals, progressed to one of the city’s oldest restaurants for sticky rice, a cart selling noodle soup, and a banh mi shop for what is reputed to be the city’s best pork baguette. In Vietnam, you say yo for “cheers”, said Hiep, so here’s yo to another great experience. Sea urchin with biryani rice, at Bibi Ji in Santa Barbara. And finally we’re off to the USA where one of the highlights was a meal at Bibi Ji, a modern and vibrant Indian restaurant in Santa Barbara. The restaurant has an Australian connection, as owner/chef Jessi Singh grew up in Australia and has a restaurant in Melbourne called Babu Ji. The menu at Bibi Ji is fresh and exciting, and we loved that it lists “unauthentic curries” as one of the menu categories. We indulged in shared plates of “street food”, including the delicious Mr Tso’s cauliflower prepared “Indo-Chinese style” (which roughly translates as deep-fried cauliflower with sweet tomato and chili sauce, a sweet/salty combo that is oh so good). All the food was beautifully presented, many of the dishes decorated with pretty flowers, but one dish that was worth crossing the ocean for was the uni biryani, locally produced sea urchin with biryani rice. 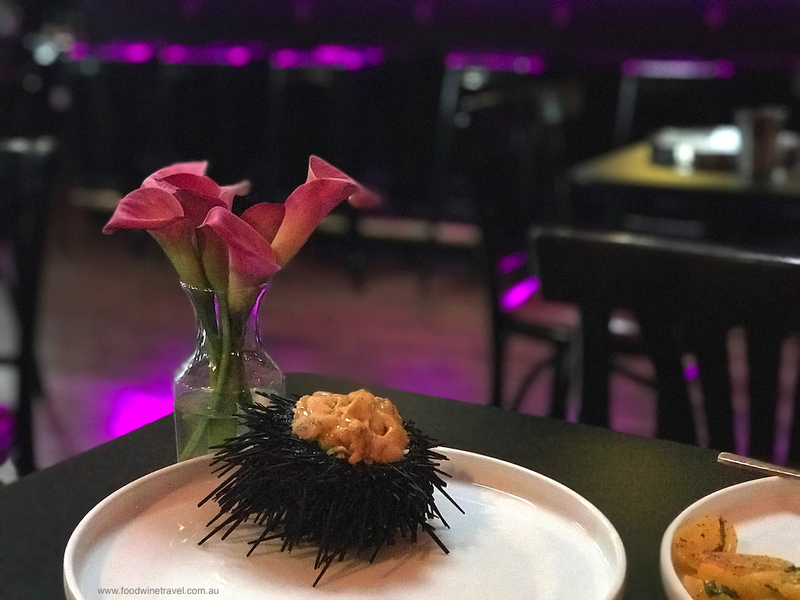 Some have said that sea urchin is Santa Barbara’s greatest gift to the world, and we’re inclined to agree. Some inspired matches at Dr Konstantin Frank in Finger Lakes. 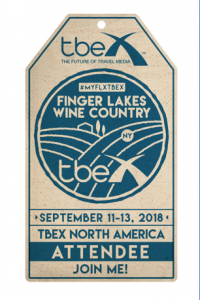 Attending the TBEX travel blogging conference in Corning, NY, gave us the opportunity to explore the beautiful Finger Lakes wine region, one of the highlights of which was a food and wine matching experience at Dr. Konstantin Frank. Manager Meaghan Frank, who looks back fondly on time she spent in Australia, welcomed us to this historic winery with a glass of crisp Rkatsiteli, an ancient grape that originates in Georgia (the country). 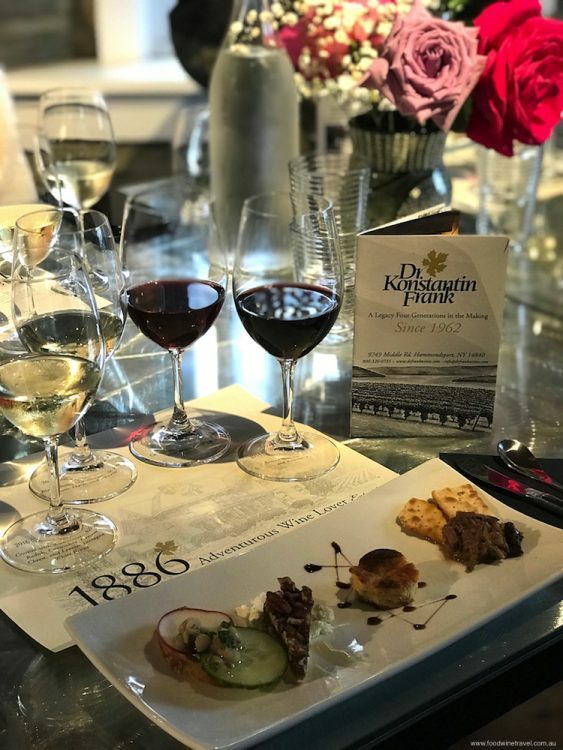 Meaghan’s great grandfather, Dr. Konstantin Frank, was instrumental in kicking off the “vinifera revolution” – turning to European vinifera grapes rather than native American varieties – thus changing the course of wine growing in the region and the United States. With sunlight streaming onto tables decorated with flowers, we sat and supped on Grüner Veltliner with crostini topped with cucumber, watercress, cream cheese, and lemon tarragon white beans; Amber Rkatsiteli with brown butter shortbread, spiced pecans, dates and chevre; Blaufränkisch with Caramelized shallot and a blue cheese bread pudding; and the most stunning match of all, Cuvée d’Amour with slowly braised beef, olives and rosemary. Such inspired pairings; we didn’t want to leave. Cape May oysters with Hudson Valley apple cider sorbet, Rivermarket Bar and Kitchen. 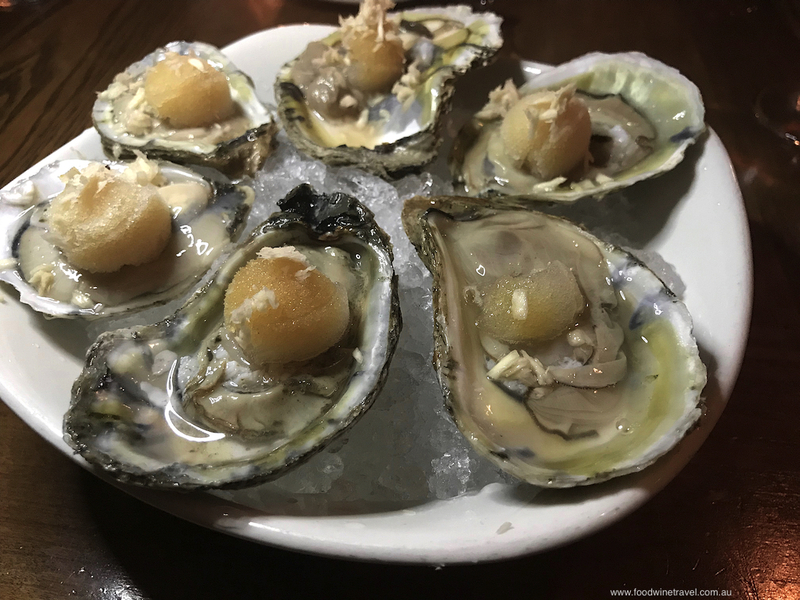 A wonderful trip around New York State saw me dining with fellow travel bloggers at Rivermarket, a casual but outstanding restaurant in the Hudson Valley. This region is awash with farmers and entrepreneurs who are producing food that is natural and sustainable. Rivermarket draws on this amazing produce for its woodfired pizzas, handmade pasta dishes and simple but beautifully cooked dishes such as Scallops with pea and wild mushroom risotto; Roast chicken with wild rice and asparagus; and Duck confit salad. But what really made my jaw drop was the wine list, which has about 350 wines from all over the world, at least half of which are biodynamic. The interior design is remarkable too, with a striking copper beer tower in the middle of the bar, and extensive use of repurposed timbers including a 200-year-old maple chevron patterned floor. Definitely a night to remember. Upscale Syrian restaurant, Damas, in Montreal. It was hard to narrow down a highlight of our Canadian visit as our friend Noreen introduced us to so many wonderful food experiences and her taste is impeccable. But in the end it had to come down to Damas, an upscale Syrian restaurant in Montreal. 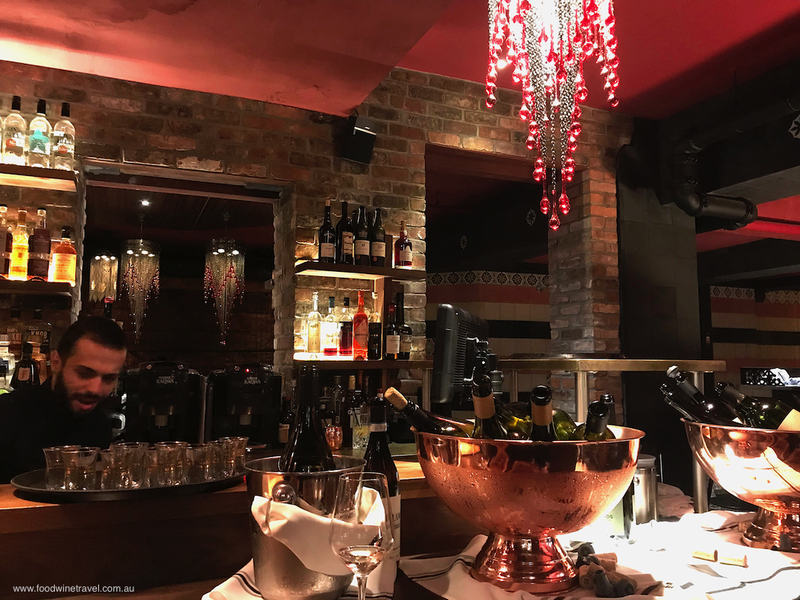 Damas has a very loyal local clientele for good reason – the décor is exotic, with pendant lights and gorgeous tableware; the service is friendly and attentive; and the food is beautifully presented and packed with flavour. With cold mezze, hot mezze, charcoal grilled dishes, melt-in-the-mouth mains and beautiful desserts, the food is perfect for sharing. We loved the fattouch; the hummus dusted with sumac; the fried kibbé stuffed with lamb, pistachio and pomegranate; and the beautifully tender warm octopus salad with white beans and herbs. Checking out Cuban treats on Eighth Street in Little Havana. 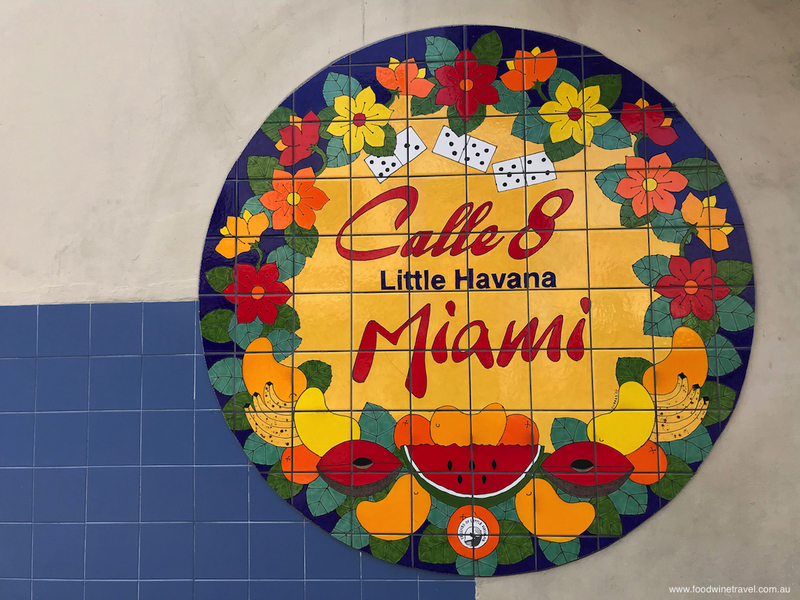 All up, we spent more than a week in Miami, Florida, and the area we enjoyed the most was Little Havana where we did an excellent walking tour with Miami Culinary Tours. We learnt so much about what the Cuban community has brought to the U.S. in a culinary sense, from pastries, plantain bananas and root vegetables to thick coffee that makes your hair stand on end. Did you know that McDonalds in Little Havana is the only McDonald’s store selling Cuban coffee? It actually has an espresso machine! The tour finished with Abuela Maria icecream at the Azucar Ice Cream Company, owner Suzy Batlle’s love letter to Cuba. 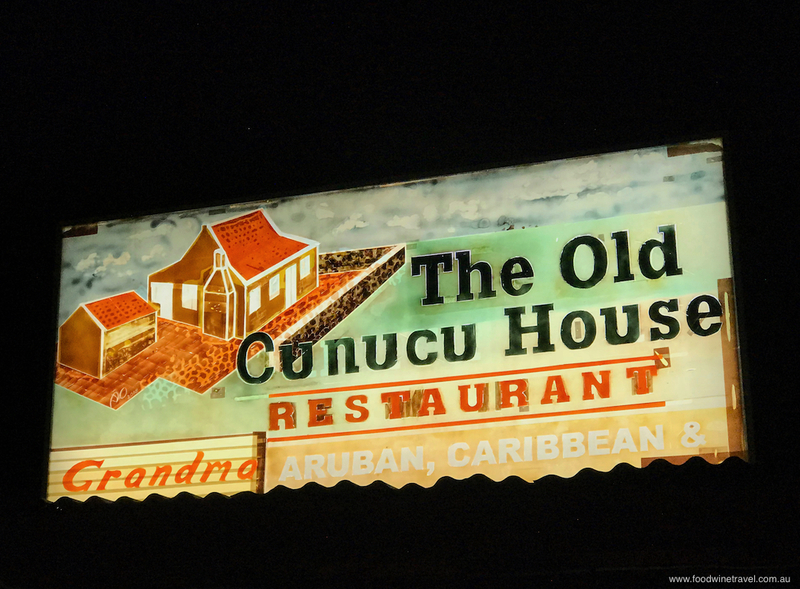 Traditional island cuisine at The Old Cunucu House in Aruba. Our Holland America cruise on the Zuiderdam took us to a number of Caribbean ports, including Aruba and Curaçao, both part of the Kingdom of the Netherlands (if you’ve read our Top Travel Experiences in 2018 you’ll know that Curaçao has a very personal connection for me). One of the languages spoken in this region is a creole language called Papiamento. There’s an expression in Papiamento called biba dushi which means “living the good life”. We experienced some of that biba dushi when we took a taxi to The Old Cunucu House in Aruba. Cunucu is Papiamento for “countryside” and the restaurant is in an old farmhouse where a musician was entertaining diners in the courtyard. Interestingly, I had written about this restaurant and its keeshi yena while reviewing a book called Dutch Feast earlier in the year, so when I realised that Aruba was on our itinerary, we pulled out all stops to go and taste the dish for ourselves. 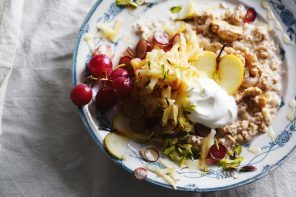 Keeshi yena is a traditional dish of chicken stewed with spices, capers, raisins and cashews spooned into a dish lined with strips of Dutch Gouda cheese. It was originally prepared by slaves using discarded cheese-wheel scraps – as with many dishes, there’s a story behind it that is worth delving into. We have re-created this dish since our return, with great results, and isn’t that what biba dushi is all about? – bringing the flavours of our travels into our home kitchen. P.S. Don’t forget to check out our Top Travel Experiences for 2018! 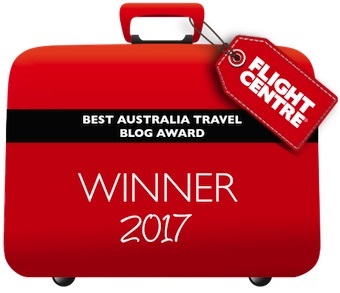 Good read, thanks Christine and Maurie for tips on a few more places to add to my ‘must visit’ list!